In a high school classroom, about 20 teachers were asked to ponder: How are they a problem for others? How can they help things go right? And how can they be more helpful to others? The teachers, who are either in their first year teaching or are new to Prince George's County public schools in Maryland, were learning about developing an "outward mindset," a concept coined by the Arbinger Institute, a consulting firm that works to change the culture of corporations, nonprofits, government, public safety, and other organizations. Prince George's County schools adopted the approach four years ago, after seeing disagreements among top district officials and poor "customer service" for parents and students. The training emphasizes caring, kindness, and recognizing the humanity of students, parents, and colleagues, district officials said. With an "inward mindset," people focus on themselves, not on other people's needs and challenges. People with inward mindsets might consider others as objects: vehicles that they use for personal gain, obstacles that they blame, or simply irrelevant. "We can get in a pattern of dealing with people," said Doug Anthony, the associate superintendent of the office of talent development for the district, who was one of the trainers for the new teachers. He pointed to disruptive students: Are teachers seeing them as real people, or an obstacle to their classroom management? But with an "outward mindset," people recognize others' needs, objectives, and challenges, and focus on how they can help others. For those with that mindset, problems start with themselves—not with someone else. For teachers, that could mean greeting students before the start of class instead of finishing up last-minute work. Or taking responsibility for when something goes wrong, instead of placing the blame on a colleague or student. "This sounds all mushy and gushy and like you have to go sing Kumbaya with kids," Anthony said. "We're not suggesting that." 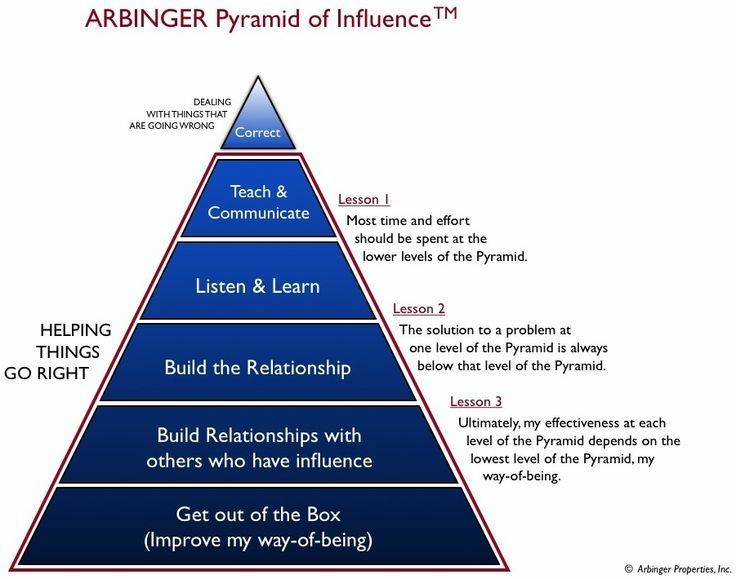 Instead, the trainers said teachers should try to apply Arbinger's pyramid of influence to their classroom. The pyramid asks people to spend the most time and effort on building relationships, listening and learning, and teaching and communicating—and the smallest amount of time on correcting others. Building relationships with students is widely considered among educators one of the most important things teachers can do to have a successful school year. Still, there were some concerns among the educators. One teacher raised his hand and said that educators still need power in the classroom to get kids to sit down and behave. Anthony responded that teachers can still have authority and be able to exert a positive influence without holding on to power. Loray White, a mentor-teacher in the district who was also one of the trainers, said she thinks teachers too often cling to the idea of power instead of respecting students' humanity and dignity. "Many teachers see themselves as authority figures and children as 'less than' themselves, with little rights or feelings," she said in an email. "As a result, when their words, actions, or voices are harsh in nature, they are surprised by a child's negative reaction/response and then view that behavior as being 'disrespectful.' This in turn results in more of the same from the teacher, and thus a cycle of negative communication is created." The Arbinger training helps teachers realize that students are people, too, White said. "They have goals, fears, and feelings of their own, and behind every behavior there is a reason," she said. "When we choose to see children as people first, this leads to a mindset change which enables positive relationships to ensue." This is not necessarily a unique concept to Arbinger. The New Teacher Center, a professional development organization, recently published a post urging educators to consider outside perspectives, rather than just their own. The group listed questions for teachers to ask themselves to cultivate empathy—like "What unmet need might this person have?" and "Can I come up with more than one way of seeing the situation?" This year is the first year that Prince George's County has incorporated Arbinger training into its new-teacher training, but it is not mandatory for employees. So far, 3,637 district employees have completed level one training—2,742 of whom are teachers. More than 180 people—including 110 teachers—attended level two training, which the district began offering last year. The Arbinger Institute was founded in 1979 by a philosopher who wanted to solve the problem of self-deception, which the institute now defines as "not knowing—and resisting the possibility—that one has a problem." The idea of the outward and inward mindsets came from that work. Heather Adams, the director of marketing for the institute, said the organization works with several schools and school districts of various sizes across the country, but could not immediately provide numbers. The institute also sells a book for educators on applying the "self-deception solution" to the classroom: The Choice in Teaching and Education. The description of the book, on Arbinger's website, says: "teacher improvement efforts are nearly universally focused on the wrong thing—they are focused on improving teaching. The Choice in Teaching and Education shows, among other things, that teaching improves the most when we focus on something other than teaching." For Prince George's County, Anthony said he thinks the training will result in a general culture shift among the district. "We're hoping that people will go in the schools, and they'll go in the offices, and they feel different about their experience," he said.